Vintech Audio has been in business since 1997 and all of our products are made in the USA. Our flagship model is the Vintech X73. This unit is a class A, all discrete, transformer balanced microphone preamplifier with circuitry based on the classic Neve 1073 module. We have done several public blind listening tests with these units comparing them to original Neve modules. Please call us with any questions you may have about any of our products. Blind Shootout conducted in New York at Legacy Studios during recent AES convention. Overseen by Frank Filipetti. Take Legacy Studios shootout online listening test now. Vintech is currently interested in trades of our gear for vintage guitars and amplifiers. We are mainly looking for jazz boxes but please call 813-334-7927 for further info. The Vintech X81 features a class A, all discrete mic preamp based on the classic Neve 1073 with a more comprehensive equalizer similar to the 1081 module. Blind shoot out of Vintech vs. Neve conducted in Nashville with Chuck Ainlay and othears... Click here to see the results. The newest members of the Vintech family are the 609CA compressor/limiter and the model 273. The 609CA is based on the classic 33609 compressor/ limiter but offers different features such as: all discrete, class A output amplifiers and continuously variable attack controls on both the compressor and limiter circuitry. 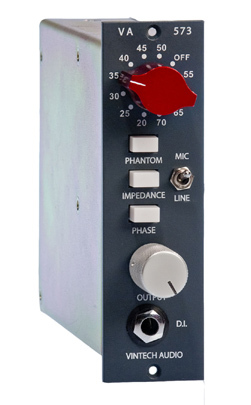 The model 273 offers two class A, all discrete, transformer balanced mic preamps along with "essential eq" on each channel. Vintech Audio is not afilliated with AMS Neve LTD. INTRODUCING THE VINTECH VA573 500 SERIES MODULE! The VA573 is a class A, all discrete, transformer balanced microphone preamplifier. It is based on the classic Neve 1073 module. The 573 also features an all new discrete high impedance D.I. that goes through the input transformer. The unit is also capable of accepting line level sources via a switch on the front panel. This unit contains no IC's and no surface mount components. It is made at our shop here in the USA. Users include: Jim Gaines (engineer for Santana and Stevie Ray Vaughn), Chuck Ainlay (engineer for George Strait, Trisha Yearwood, Mark Knopfler, many more), Eddie Kramer (Jimi Hendrix, The Rolling Stones), Levon Helm (the Band),David Foster,Peter Frampton, Dan Shea (Jennifer Lopez), many more.